Related Companies is in advanced negotiations to replace Cooper Square Realty as the new managing agent at Rector Square, the Battery Park condominium that is going through foreclosure proceedings, according to sources familiar with the case. Michael Miller, the court-appointed receiver for Rector Square, confirmed that Related is his choice for the managing agent. However, a New York State Supreme Court judge must sign off on the recommendation before any changes are made. “The judge had some concerns about the proposal they submitted to me,” Miller said. Related’s plans for the building were revised and are still under discussion. Miller added that lawyers for the building’s sponsor and developer, Yair Levy, raised concerns about the plans including issues surrounding renovation work in the unsold units. Anglo Irish Bank in February filed to foreclose against Rector Square at 225 Rector Place, after Levy defaulted on a $165 million loan. Ironically, Levy acquired Rector Square from Related when the 304-unit Condo Operated As A Rental Under The Name Parc Place. 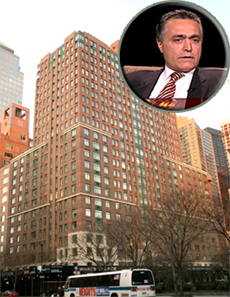 As part of that deal, Levy also acquired a residential building at 101 West 87th Street, a similarly troubled condo conversion that operates under the name Park Columbus. Related has a history of working with lenders to work out distressed properties. In the 1990s, Related helped turn around the Aurora on West 57th Street and Tribeca Tower on Duane Street. In an earlier interview, Related Chairman Stephen Ross said the company has been in talks with Deutsche Bank about rehabilitating several properties around the city. Related officials declined to comment, but sources familiar with the firm confirmed that they were in discussions about taking over management at Rector Square. Meanwhile, Miller the receiver is scrambling to unravel financial difficulties at Rector Square, as Levy failed to pay months of common charges and PILOT payments to Battery Park City Authority, which owns the ground lease on the building. In a March 19 letter to residents, Miller noted, “we’re sorting through challenging issues related to insurance, lease renewals, [and] capital contributions which were apparently transferred to, co-mingled with and spent as operating funds,” which if confirmed could violate the offering plan if not New York State law. When asked about the funding issues, Marc Kotler, vice president at Cooper Square Realty, which has managed the building since mid-2008, said he would get back to this reporter with a response from the right person. Levy was not immediately available for comment.